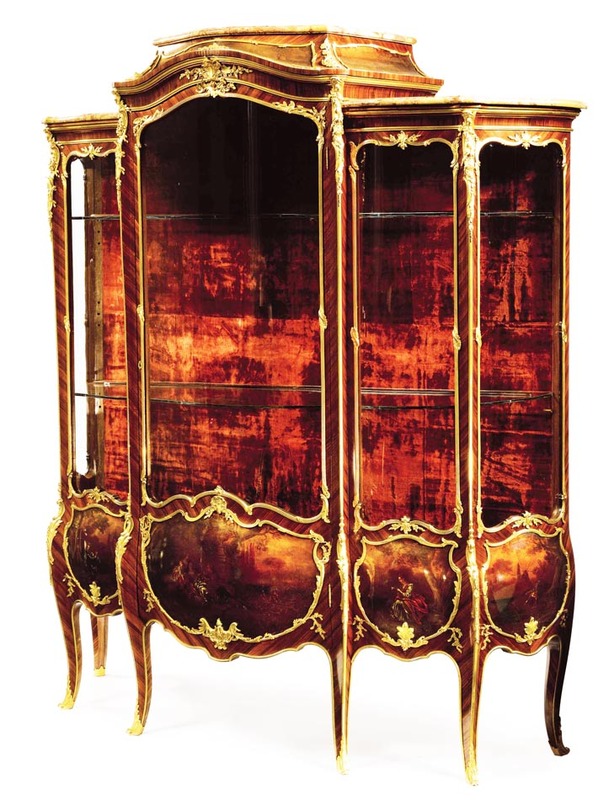 FRANÇOIS LINKE (1855-1946) A Very Fine and Large French Louis XV Style Gilt-Bronze Mounted Kingwood and Vernis Martin Decorated Vitrine with a three-part Brèche d'Alep marble tops, the lock has been removed to reveal the stamp Ct. LINKE/PARIS. Linke's Index Number 76 "Grande vitrine Louis XV 3 corps bois de violette Panneaux Vernis Martin". Circa: Paris, 1901-1914. There are eight versions of this unusual and distinctive display cabinet in Linke's 'green register' or daybooks. Four are in the original concept as in the present lot with vernis Martin painted panels and four with marquetry panels. Although the design of the present lot could be mistaken for work carried out in Paris in the late 1880s in the style of Roux et Brunet, the concept is exclusively that of the Linke stable. The common theme is explained by Linke's employment of the sculptor Léon Messagé (d.1901) who had earlier designed pieces as an independent artisan for Roux. The most distinctive element being the now almost iconic 'crab-like acanthus' first identified by Christopher Payne in 19th Century European Furniture, Antique's Collector Club, Woodbridge, 1981. Although this model by definition of the early model number alone must have been first thought of in the late 1880s or early 1890s there is no obvious record until the green registers which were compiled in circa 1901 after Linke's success at the Paris 1900 World fair. The first recorded date is1902 for a vernis Martin model painted by Carl Guilbert on 6th January for a fee of 150 French francs, just over twice the cost of the marquetry versions. Despite inflation, Linke only paid Guilbert the same fee for panels on the last version painted in August 1908. However Linke did accept the increase in the cost of the locks, made by his brother Clément Linke from 34 to 54 francs! However the cost price of this version of the cabinet rose from 1,914 francs 75 centimes in 1901 to 2,860 in 1914 the date of the last model made.